[Image: AzLNxEX.jpg]MUMBAI: Star India will launch its free-to-air (FTA) sports channel Star Sports First on 21 July, a week ahead of Pro Kabaddi League’s (PKL) new season. The new channel’s tagline is ‘Aana Hai First’ (We have to come first). Star Sports First will feature sports content including kabaddi, cricket, badminton and boxing. Besides a variety of sports content, the channel will also air PKL Season 5, which kicks off in Hyderabad on 28 July. In addition, the channel’s programming calendar will comprise BCCI domestic cricket tournaments and domestic football. TelevisionPost.com was the first to report that Star would launch a free-to-air (FTA) sports channel. Star had recently won a slot on Doordarshan’s free direct-to-home (DTH) platform Freedish. Star Sports First will be primarily distributed through Freedish. The broadcaster is promoting the new channel with a TVC featuring MS Dhoni. “Kya aapki life se sports action missing hai,” asks the former Indian cricket captain, in the film ‘Star Sports First, Aana Hai First’. The TVC runs fans through a diverse range of sports that will now be accessible on the Star Sports First channel. 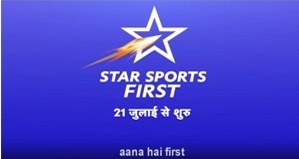 The launch of Star Sports First is supported by a 360-degree marketing campaign, ‘Star Sports First, Aana Hai First’, which includes television, radio, OOH and on-ground activations. Star Sports First will replace FX HD, which will shut down on 20 July. The broadcaster has got the MIB approval to rename FX HD licence as Star Sports First. FX HD was earlier scheduled to shut on 15 June along with FX and Star Movies Action. However, the broadcaster issued a corrigendum extending the shut-down date of FX HD. Recently, Star had rejigged its sports network by shutting down Star Sports 4 and Star Sports HD 4 and launching Star Sports Tamil 1, Star Sports Select 1 and 2. It had also renamed Star Sports 3 as Star Sports Hindi 1. Star Sports Tamil 1, which is the second regional sports channel from Star, is a mirror of Star Sports Hindi 1, which primarily airs India cricket and local leagues. Star Sports Select 1 and 2 channels are mirror channels of Star Sports Select HD1 and HD2, the exclusive home of international sporting events. Star Sports network with 11 channels broadcasts premier sporting events which include cricket coverage under the purview of the International Cricket Council (ICC), Board of Control for Cricket in India (BCCI), Cricket Australia, England & Wales Cricket Board (ECB) and Asian Cricket Council (ACC); Pro Kabaddi; Tamil Nadu Premier League (TNPL); the Indian Super League (ISL), Premier League, Bundesliga; Badminton World Federation (BWF) events, Premier Badminton League (PBL); Hockey India League (HIL); Formula 1; Wimbledon, The French Open and International Premier Tennis League. Current time: 04-26-2019, 09:33 AM Powered By MyBB, © 2002-2019 MyBB Group.